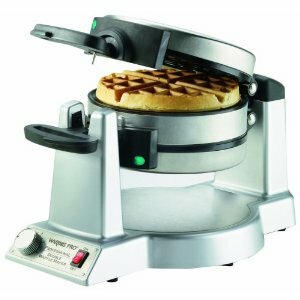 We just got a Waring WMK600 Double Belgian-Waffle Maker – and we love it! We are really lucky to have this one to try as the owner of the vacation home that we are staying in right now just bought one for the house. We had been thinking about buying a waffle maker for home because the boys love their waffles but never quite got around to getting one. Now we definitely have to buy a Waring WMK600 Double Belgian-Waffle Maker when we get home! The Waring WMK600 Double Belgian-Waffle Maker gets 4.5 Stars on Amazon with over 170 reviews and we can see why it is so highly rated. As soon as you take it out of the box you can tell that it is good quality. It certainly feels very solid and robust in quality. The great thing about the Waring Double Belgian-Waffle Maker is of course that you can make 2 waffles at a time. This is a really great feature if you have more than one family member waiting at the table for those waffles – it really speeds things up! The instructions were very easy to follow. Really you just plug it in and away you go. It didn’t take very long to heat up. There is a handy measuring cup for the waffle mix. Just make sure you spread out the mixture onto the waffle iron so that you get that perfect looking waffle (OK I admit I didn’t do that the first time)! 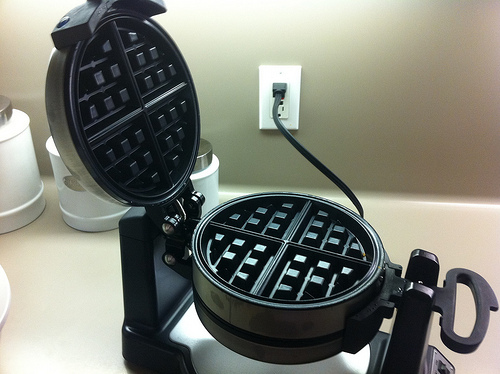 Just follow the same process and the Waring Double Belgian-Waffle Maker will quickly cook 2 perfect waffles. When we get one for home I am going to keep one side dedicated to gluten free waffles only – another benefit of the double waffle maker as you can keep the risk of gluten cross contamination (a big issue for us gluten free people) to a minimum. There is a 6 setting browning control so everyone can have their perfect waffle. The depth and size of the waffle seems just right too. It was evenly cooked, and the setting number 3 seemed to be perfect for how the boys like their waffle. We also liked that you do not seem to have to use oil with this waffle maker. The non stick surface seemed to work perfectly without it as the waffles all came out easily and still all in one piece! Clean up was really easy too. Really there just wasn’t any clean up as the waffle came out so well out of the machine and didn’t even leave any crumbs behind. So we are really pleased with the Waring Double Belgian-Waffle Maker . Amazon has it at a great deal for $95 with Free Shipping.